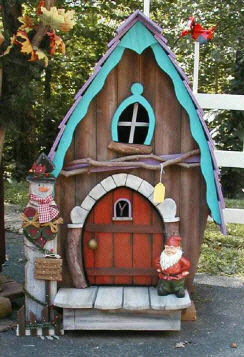 These large fairy houses will add an enchanting accent to any garden or lawn. Our customers use them as lawn decor, doghouses, even well pump covers as well as scores of things we haven't even thought of. Each one is hand made and painted by Art. They come in a wide variety of colors and can be customized. The hand-painted trim colors and adornment are usually all unique. These houses are typically custom order. We need the order at least 3 weeks in advance of scheduled pickup. On occasion we may have certain ones available; call us for availability. Check out our small table-top, birdhouse size fairy houses - or our Gnome Homes, which are about 2' tall ('bout ½ the size of those pictured above). 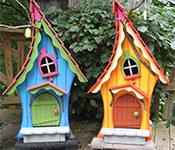 We custom-design and build fairy houses for a wide variety of clients, from large theme parks, other corporate displays and private uses for garden sheds or children's playhouses. Feel free to contact us about any special requirements you may need.